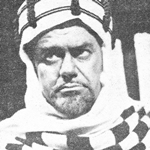 An ambitious local production of Shakespeare’s Othello (starring Raymond Westwell, pictured) was the highlight of ABC station ABV2‘s program schedule in Melbourne on Wednesday 18 November 1964, as reported in both TV Week and TV Times..
Television that day didn’t kick off until late morning — with the first program of the day being For The Juniors, a schools program on ABV2 at 11.05am. It was a 20-minute program, and ABV would not resume until the next schools program at 1.25pm. HSV7 and GTV9 both started their day at 11.30am with brief news updates, then it was over to English series Interpol Calling on Seven and American series The Case Of The Dangerous Robin on Nine. Lunchtime movies started at 12.30pm on both Seven and Nine — with the 1941 film The Great Lie, starring Bette Davis, on Seven and Man With The Gun, with Robert Mitchum and Angie Dickinson in one of her earliest roles, on Nine. 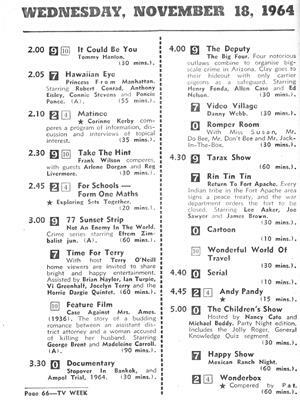 After the movies, Seven went onto series Hawaiian Eye, while Nine competed with game shows It Could Be You (with Tommy Hanlon Jnr) and Take The Hint (with Frank Wilson). Corinne Kerby hosted ABV2’s afternoon magazine show Matinee. 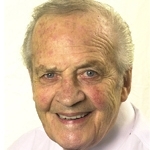 Seven’s afternoon variety show Time For Terry followed at 3.00pm. The new kid on the TV block, ATV0 started its broadcast day at 3.30pm with a documentary film before Romper Room for the pre-schoolers. Then it was the battle of the after school shows — Video Village and The Happy Show on Seven, The Tarax Show on Nine and The Children’s Show (Nancy Cato and Michael Boddy) on ATV0. 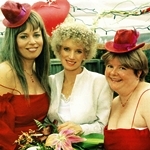 ABC’s after school line-up included Andy Pandy and Wonderbox. The evening started with Texas Rangers on Seven, Bomba The Jungle Boy on Nine and Invisible Man on 0, while ABV2 debuted Canadian adventure series Forest Rangers. Jimmy Hannan presented his Top Pop Of The Day at 6.25pm on Nine — and it was a three-way battle for news at 6.30, with Brian Naylor reading the news on Seven, Eric Pearce on Nine and Brian Wright and John Royle on 0. At 7.00pm, Seven’s quiz show Coles £3000 Question (with Roland Strong) was up against US comedies My Three Sons on Nine and Grindl on 0, while ABC had its news at 7.00pm. 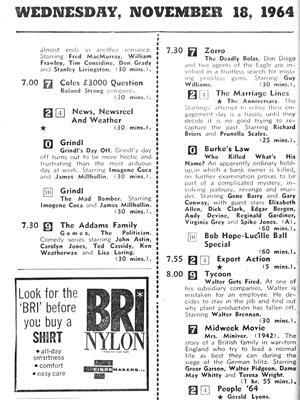 ABC’s post-news line-up includes English comedy The Marriage Lines, followed by the 5-minute Export Action then Gerald Lyons‘ People ’64. 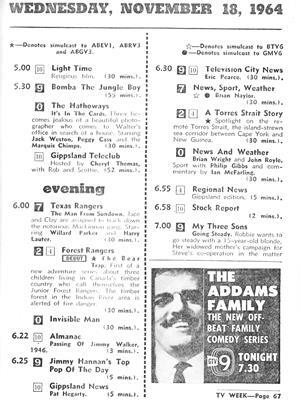 On the commercial channels, the evening continued with new sitcom The Addams Family on Nine, up against Zorro on Seven and Burke’s Law on 0. Seven’s midweek movie at 8.00pm was Mrs Miniver, the 1942 film starring Greer Garson and Walter Pidgeon. ATV0 had only been operating three months but had just overhauled its 8.30pm timeslot in response to dragging ratings. From early in November the station had changed its schedule to have a movie every night of the week at 8.30pm. The film on this particular evening was Misfits, starring Clark Gable, Marilyn Monroe, Montgomery Clift and Eli Wallach. ABC’s 2-hour-and-20-minute broadcast of Shakespeare’s Othello featured English actor/director Raymond Westwell in the title role, joined by co-stars Keith Lee, John Gregg, Judith Arthy, Frances McDonald (pictured with Westwell), Terry Norris, Kenric Hudson, Don Crosby and Joan MacArthur. Westwall had played other characters in Othello in overseas productions but this was his first time playing the lead role in a full-scale presentation of the play. The performance was produced by Patrick Barton and was taped at the ABV2 studios in Ripponlea over four days, utilising four large-scale sets. While it was not the first Shakespeare play to be staged by ABC, the production had encountered some challenges — such as make-up artists unable to obtain in Australia the special make-up to give Westwell just the right complexion to play Othello as an Arab. They later found four colours which, when blended, produced the right shade. Wardrobe supervisor Keith Clark also remarked it was the largest costume job he had ever done, explaining that he had to make quilted sleeves and pad and quilt all the trousers and some improvisation was needed for other costumes. “We made one set of armour out of felt and leather,” he told TV Week. 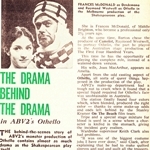 ABV2’s production of Othello was later seen on ABC stations in other states — with the program airing in New South Wales and the ACT the following February. 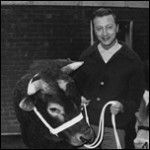 Meanwhile, Joff Ellen was the main guest star on Graham Kennedy‘s In Melbourne Tonight at 9.30pm, while 0 had US variety show The Steve Allen Show at 10.00pm and Seven had British variety show Big Night Out at 10.25pm. 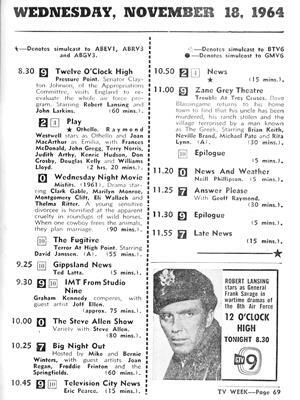 After IMT, Eric Pearce was back to read the late news, then Zane Grey Theatre (including an appearance by Australian-born actor Michael Pate) and Seven’s quiz show Answer Please (hosted by Geoff Raymond) battled for late night viewers. 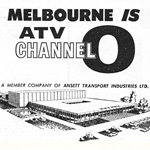 Neill Phillipson presented a late news summary on ATV0 before it signed off for the night at 11.25pm. 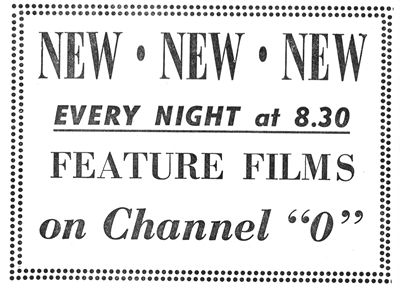 Source: TV Week, 14 November 1964. 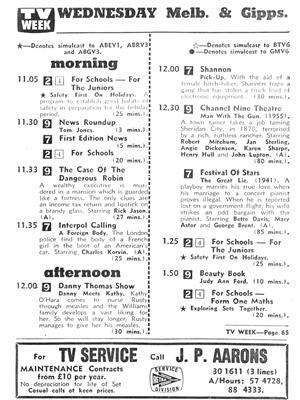 TV Times, 18 November 1964. Sydney Morning Herald, 3 February 1965. I loved Bomba. Roland Strong was an old grump.